Around 10:00 in the morning I plan to take the bus the the Corea Housing Complex to go to Mai Nefhi with Feshaye and his two kids, Hiab and Elilta. I have to wait for a whole. Many buses are passing, but not the number 1 or 12 to Sembel. While sitting a man attracts my attention. "there is your bus, number 1" I ask him how he knew where I was going. "I remember you from last year", he answers. With Terhas and Feshaye I have a second breakfast. I already had kicha and coffee with Gebrehiwot and his family. Terhas invites me to eat scrambled eggs with bread, and we drink tea. Eating is a social event in Eritrea, and refusing is a bit of an insult. For the children the visit of "Baba Hans" means he brings some little presents and some excitement in their lives. At 11:00 we are on our way to Mai Nefhi. 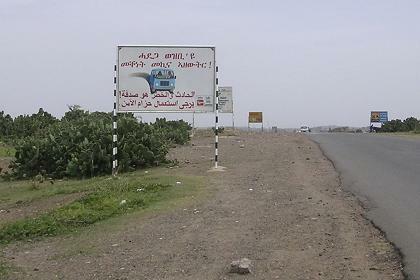 Godaif, Road to Mendefera, take the road to Himberti (which branches off the road to Mendefera at Adi Guadad) and after some 15 kilometers the sign with Mai Nefhi points to the right. The road is only a few months old, and an excellent track for bicycle racing & training. After another 10 kilometers a sign points to Hotel Mai Nefhi. The water reservoir of Mai Nefhi is surrounded by bougainvilleas and large cacti. Some boys approach me "Money. Money." "Where? ", I ask them, as if I do not understand. They try again, and again. I guess life is difficult for these young boys in this remote place, but I will only reward a service (if needed) and not respond to plain begging. While I took the dangerous route, close to the edge, Feshaye takes the safe route, farther from the lake. We meet at the dam and walk from one side to the other, enjoying the views from both sides of the dam and its water purification installations that satisfies the water needs Asmara and its environs with 45 thousand cubic meters water daily. In front of the hotel we have a drink, while the children are playing in the small recreation ground, returning every once and a while to have some water. Feshaye shows me the Mai Nefhi colleges that have been build here recently. An enormous complex of schools and prefabricated houses for the students. At 13:00 we drive back to Asmara. I get out at Godaif, where I will start a walk back to the center of Asmara, to have closer look at this part of Asmara, where a lot of new buildings have been constructed during the last two years. I visit a bar to drink some water. With the men I discuss the consequences of the Eritrea-Ethiopia conflict. One of the men, who introduced himself as Samuel, explains the situation "no war, no peace" is the worst for the country. Peace would be better, but even war is better, to kick Woyane out of the still occupied Eritrean territory. "What else is the solution to get the land that the EEBC awarded to Eritrea, but is still occupied by Ethiopia? The EU does not care, the US supports Ethiopia. So war is the only option." I guess there is another option, to negotiate, but to negotiate what? Although both Ethiopia and Eritrea have agreed to abide with whatever decision is arrived at by the International Court of Justice in The Hague (Article 4.15 of the Algiers Agreement explicitly states that the decision is final and binding) Ethiopia rejected the EEBC ruling as "unjust and illegal" and demands that the boundary commission should "rectify" their decisions! I guess it is the moral task of the Western world, EU and US to help to end this situation, asking, or if necessary forcing Ethiopia to show some respect for international law and order. And to show respect for the millions of people that are on the edge of starvation, because feeding them has a lesser priority for Ethiopia than feeding their artillery, to get what EEBC did not award them. Eritrea has the capacity in terms of experience and self confidence of its human reserves, machinery and technology to have bright prospects for economic development, if only there would be a lasting peace. "We know what to do, how to do it, and we have the people to do it. We are awaiting the moment that we can start to do it", Samuel explains to me. "Ethiopia on the other hand is undermining the peace process, while at the same time asking to cancel its debts, and is begging for economic assistance and emergency aid, pointing to the fact that food shortage has reached an alarming stage". 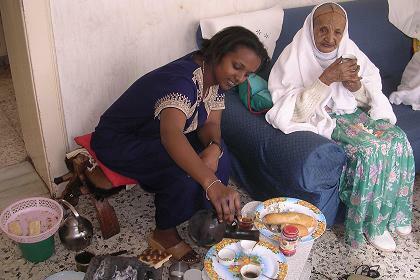 Breakfast with Luwam and her grandmother - Asmara Eritrea. 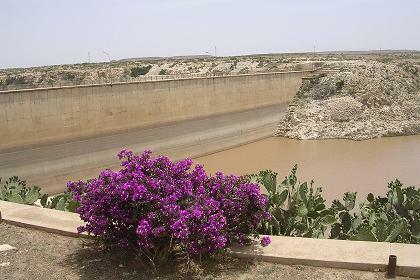 Dam and water reservoir of Mai Nefhi - Eritrea. Road to Mendefera "fasten your seat belts for a safe trip" - Asmara Eritrea. 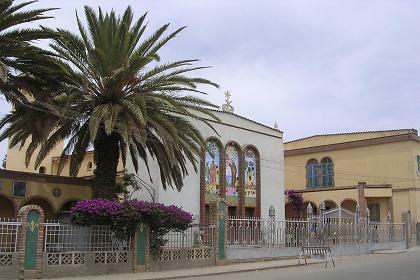 San Antonio's Church - Godaif Asmara Eritrea. 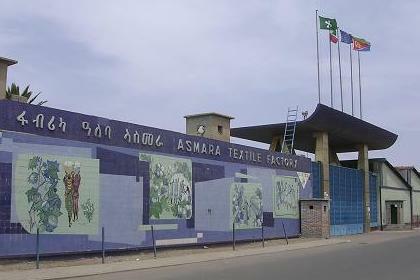 Asmara textile factory - Godaif Asmara Eritrea. 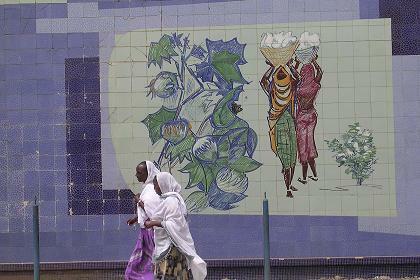 Asmara textile factory (detail) - Godaif Asmara Eritrea. 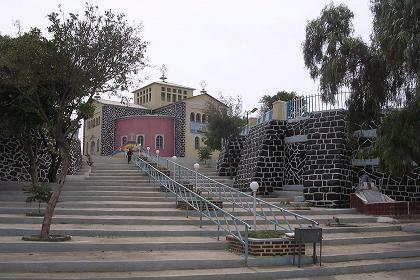 Ewostatewos church - Godaif Asmara Eritrea. 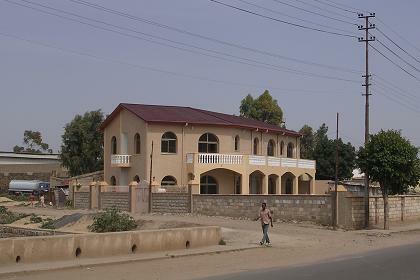 New public library - Godaif Asmara Eritrea. 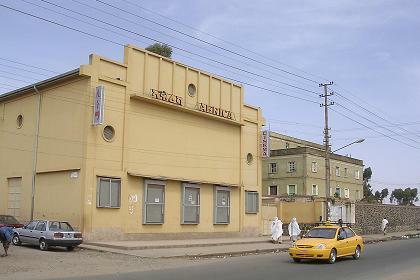 Cinema Africa - Godaif Asmara Eritrea. 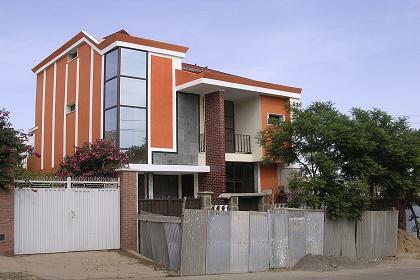 New residential building - Gejeret Asmara Eritrea. 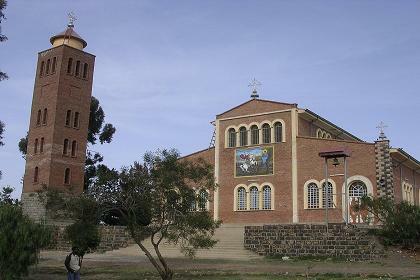 Orthodox church - Gejeret Asmara Eritrea.